Discount Cimarron 70x14x12 Residential Frame Corner Kit - Free Shipping! Our Cimarron 70' L x 14' W x 12' H, 1 1/2" residential batting cage frame corner kit is the most economic way to hang a batting cage net in any open space. 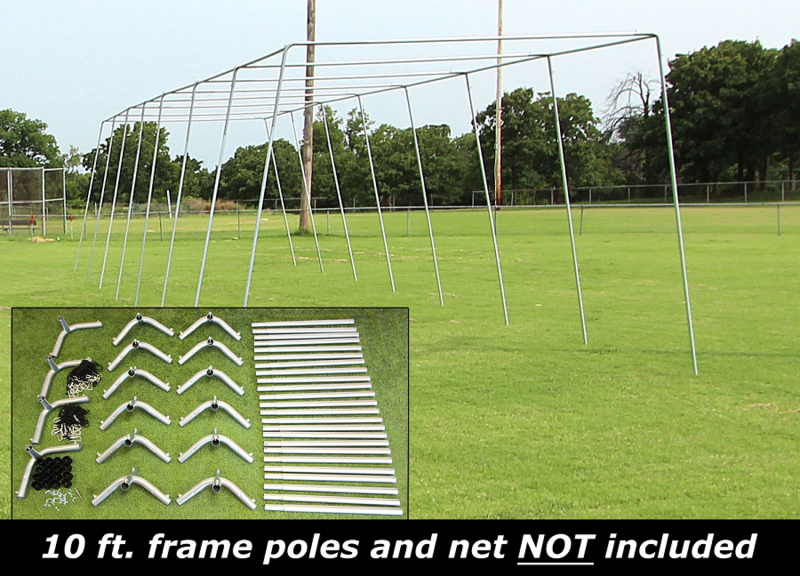 It comes with everything you need to assemble a batting cage except the poles and net. Save money on the cost of shipping heavy steel conduit poles by purchasing the poles at your local hardware store. You will need to purchase 28 10' poles (1 1/4" thin walled EMT Pipe). Your cost for those poles should be about $450. THE CIMARRON GUARANTEE: Cimarron Sports guarantees 100% satisfaction with your 70' x 14' 12' Frame Corner Kit. Products may be returned for a refund within 31 days of the date the product was shipped to you, when returned in accordance with the Cimarron Sports policies outlined in the Shipping & Returns section of this website. Click here to download an easy to read, printable PDF of the Cimarron 70x14x12 Residential Frame Corner Kit Owner's Manual.